Winter is well under way, and it isn’t showing any signs of letting up. Check out these winter driving tips from us here at College Chevrolet Buick so you can have safer travels this season. While heavy winter snow and icy roads may be cause to want to get off the roads quickly, speeding isn’t the way to do it. Driving at increased speeds leave you with less time to stop, effectively increasing the chances of an accident. Slowing down will provide you with more time to stop. Be sure to accelerate and decelerate slowly as well. Not only will slowing down make your drive even safer, but you’ll also see reduced fuel consumption as well! Idling is one of the most common wastes of fuel, and more drivers choose to idle in winter to warm up their car. Since it’s such a major drain on fuel and, by extension, your wallet, it’s wise to drive at a moderate speed to warm up your vehicle. Doing so will help increase fuel economy, get you on the road quicker, and save you money at the pump. Under normal circumstances, drivers should keep a following distance of around three to four seconds. During winter, the following distance should be increased to eight to ten seconds. Doing so will provide you with more time to stop in the event another driver hits their brakes unexpectedly. During this time of year, the weather outside can be pretty frightful, especially when driving on the road! When you live in a state like Michigan, you need to be prepared for winter’s worst. Fortunately, there are plenty of simple ways that you can make your driving safer during this time of the year. Be sure to follow these tips for winter weather driving in order to avoid any chilling experiences on the road. Cruise control is a very helpful feature for driving on highways and keeping up with traffic. However, when there is a wintry mix covering the roadways, you will want to rely on your own driving skills in order avoid any possibility of losing traction while driving. Due to the conditions of the road during winter, many vehicles may need to stop at any time to avoid a nasty situation. If you want to avoid making contact with the back end of one of those vehicles, you will want to leave a safe distance between you and the vehicle in front of you at all times. When descending a hill covered in ice and snow, it is important to always be in control, as you could start sliding down. The only thing more frightening than descending down a hill going forward is descending it backwards. 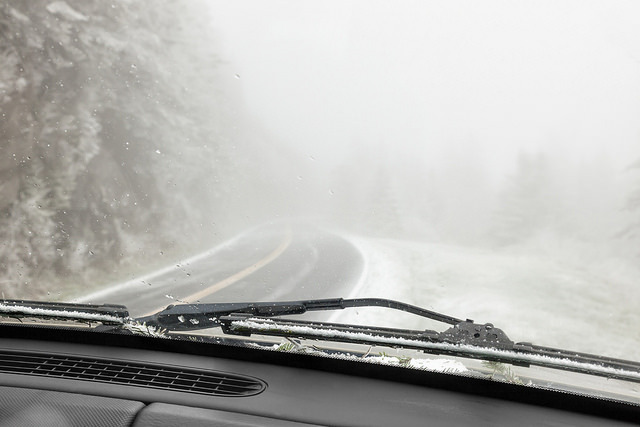 Avoid stopping when ascending or descending to help avoid sliding during your drive.